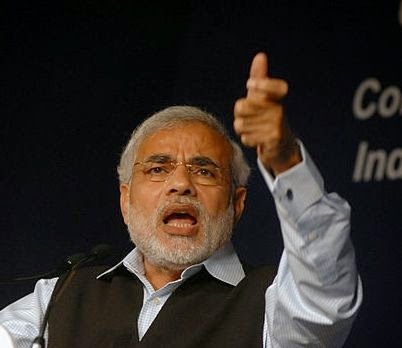 It is already over two months that Narendra Modi has taken over as the prime minister of the country. While some may call it as a ‘honey moon period’ others will say that its actions during last few months are an indication enough of shape of things to come. It goes without saying that Modi is the Pracharak of RSS, which is aiming at converting the secular democratic India into a Hindu Rashtra. Modi came to power with many planks, many factors went into his victory, one of that was the catchy phrase’ “Acche Din Aane Wale hain” For the people, who have been restless due to rising prices and inflation, there has been no respite and many of them have started feeling the regret of being taken in by the propaganda of Acche din… As such this was a major propaganda point so a large section of people are disgruntled. This Government did begin with a major initiative in the area of relationship with the South Asian neighbors. It invited all the heads of South Asian countries for swearing in ceremony. People had their eyes on the invitation for the Pakistani Prime Minister Navaz Sharif as the BJP’s longest ally Shiv sena was opposed to it. Overruling objections from Shiv Sena, Modi went ahead in getting Sharif to visit to India. This may open the path of peaceful relations with the neighbors, Pakistan in particular. One knows that a peaceful neighborhood is more conducive for growth and development and India has to gain a lot in terms of trade, education and medical facilities being opened up for these countries and making a good deal of revenue. At another level the Government showed its shift away from India’s West Asia policy as Sushma Swaraj, the Foreign minister went on to equate Palestine, the victim with the oppressor Israel, who has violated most of the UN resolutions. The vote on this matter did follow the Indian policy so far, and that is a matter of great relief. Modi as Prime minister is wearing his religion on his sleeve. Be it participation in Ganga Aarti in Varanasi or participating in Puja in Pashupatinath Temple in Nepal, he has no qualms about doing the same as the head of a theoretically secular state. The formation of the Government gave a signal that doubtful elements like Sanjeev Balyaan, who is widely seen as having a major hand in Muzzafarnagar violence, as a reward for his role in the communalization of the polity and this is something which needs discouragement if we want to preserve the integrity of the nation. The case of Gopal Subramanian, an outstanding advocate, came as a shock to many as he is known to be competent and upright. He was denied the nomination as the judge on Supreme Court bench. One recalls that as Amicus curie of the Court Mr. Subramaiam had brought forth the links of Sohrabuddin fake encounter and the present BJP President Amit Shah, it is suspected that to be the reason for this denial. Subramaniam Swamy the top leader of BJP showed his discomfort with Gopal Subramaniam as according to Mr. Swami, Gopal had hurt the feelings of Hindus in the case of Ram Setu issue. On other fronts there are symptoms which are ominous so to say. Right in the beginning, a confidential report was deliberately leaked that the major foreign funded NGOs, like Green Peace are retarding the country’s growth. We know that this foreign funding is regulated by the home ministry and there are enough checks and balances to prevent adverse use of funds. This leaking of the report and the utterances of the top Govt officials has sent the message down the line where by the harassment of these NGOs has come up retarding their work. Surely these NGOs are also the ones who have been fighting for the cause of environment, problems related to poverty and other issues related to peoples’ empowerment. As such these dissenting voices should be an integral part of a caring democracy. While MHRD minister has not stated clearly but Mr. Dinanath Batra of Shiksha Bachao Abhiyan Samiti has stated that he met the HRD minister who has promised him to change the school syllabus to make it in tune with the ideology of RSS, which is parochial and sectarian. Similar changes were brought in during the NDA regime 1999. A sample of this was to introduce courses like Jyotish Shatra (Astrology) and Paurohitya (Performance of religious rituals) in our universities. The government instruction to celebrate the Sanskrit week was seriously opposed by many states, Tamil Nadu in particular. The appointment of Prof Y.Sudrashan Rao tells the tale as to in which direction our research is going to be directed. Prof Rao has been working on the project to prove the historicity of Mahabharat. He has also come forward in the defense of caste system on the grounds that it worked and that nobody had complained about it. It is no coincidence that the Goa’s BJP’s deputy Chief Minister went on to say that he is a Hindu Christian, this deliberate confusion being the earlier use of Hindu as a geographical category to the presently used religious category in a way is the violation of the religious freedom of the minorities in India. Another BJP MLA opposed Sania Mirza being appointed as the brand ambassador of Telangana, on the ground that she is ‘daughter-in-law’ of Pakistan. This statement goes against our Constitution and has not been strongly opposed by the top leadership, who has soft peddled the issue giving a wrong signal. The so called Hindutva agenda is being brought into operation slowly. The minorities affairs minister Nazma Heptullah stated that Muslims are not a minority, while Parsis are. Parsis are a comparatively better off community while Sachar Committeee tells us the plight of Muslim community and need to initiate affirmative action for them. The Article 370, which was brought in due to peculiar circumstances and is a bridge between Indian and Kashmir, is being questioned. The Uniform civil code is being bandied without going into the subtle nuances of social reform and the need for grounding of such a law in the concept of Gender Justice. These topics have been debated endlessly and need to be handled taking along the opinions of people of Kashmir on ones hand and women from minority community on the other. The need is to ensure that interests of the country’s people are kept uppermost, the way invitation to Nawaz Sharif shows, should be appreciated. The other measures show that there is an attempt to undermine the diverse nature of our polity, there is an attempt to bring in RSS agenda through education and culture, which are dangerous and need to be opposed.